Fans all around the world tear their hair out over which version of which story in the Macross franchise is the “real” one, and which is the “dramatization” or “parallel world” version of events…. In Japan, most fans are rather chill. Why not just relax, everybody? Just over 20 years ago, Shoji Kawamori was kind enough to sit down and answer some fan questions, and among them, he gave us some insight into his philosophy of media-based storytelling. The takeaway from all this, is… You’re thinking about it too hard. The following is part of a transcript from an interview with Shoji Kawamori on “Macross 7 Fun Net” from September 24th, 1998. Click the “Read More” link to read the words of wisdom from Kawamori himself, which I have translated for your pleasure. Hot on the heels of the recent translation of the Kazutaka Miyatake interview from the SDF-1 book, comes yet another Miyatake heart-to-heart, this time the big man is talking about his work on Super Dimension Century Orguss, or as I like to call it, “Kei Katsuragi’s Adventures in Wonderland”. I hope you find it as fascinating as I did, giving an insight into the state of mind he must have been in during that entire 1982-84 period. This interview is from a booklet that was included with the first edition of the Megahouse Variable Action Hi-Spec Orguss toy from earlier in the year. I chose to tackle it at this time since it would be perfect to brush up on our Orguss trivia as this year’s Macross World Convention will have a dedicated ORGUSS panel for all your Space-Time Oscillation needs! The translation starts after the jump. Enjoy! 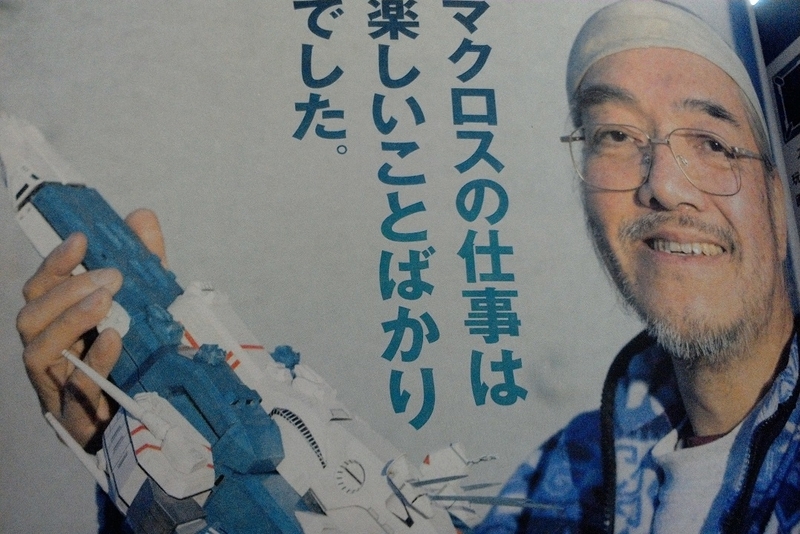 As we board the hype train leading up to Kazutaka Miyatake’s exhibition of original artworks, let us look at a recent interview with him conducted earlier this year for the “SDF-1 Macross: Thorough Dissection” book — you know, the one which also doubles as an enormous 1/2400 scale papercraft model of the Fortress Exceeding Space and Time itself (the cover of the book stoically assures us that it is genuine “Deculture Scale”, no less).